Now I don't mean to be jealous or anything, but this question seems like it should be a comment. 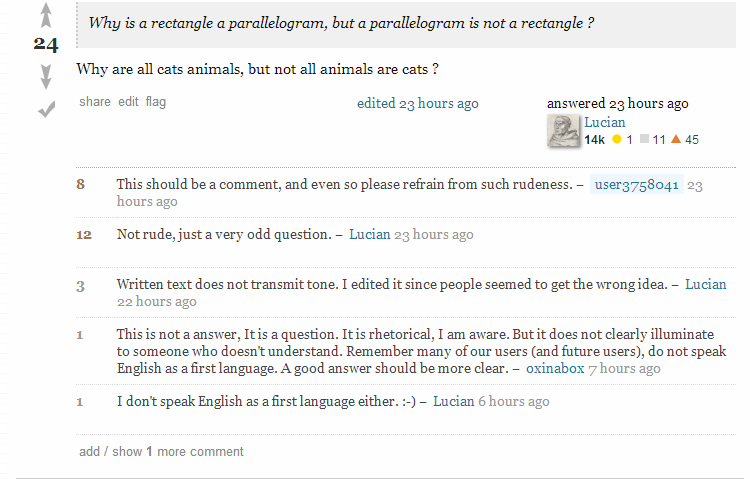 You can find the question here: Why is a rectangle a parallelogram, but a parallelogram is not a rectangle? As you can see this answer is a question itself, and it vaguely explains the relationship between parallelograms and rectangles unlike most of the other answers. Even so, it has 24 up votes, that is the second most voted answer on my question. There are a wonderful amount of other questions which are by far better quality than this. I even tried flagging it, and selecting the option stating that it should be a comment instead. What should I do about this, and why would this even happen? The internet is dominated by cats. 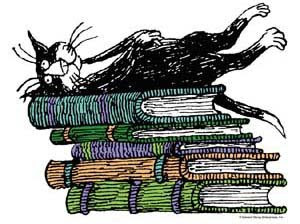 Anything with cats pictures or involving cats gets lots of votes or likes. Sorry gotta go, my feline master demands my attention. To answer a question with another question $($yet again$)$: how come that all those countless tricky integrals I've solved brought me no more than a few votes each, while a trivial answer to a simple question earned me a silver badge, by gaining over $50$ votes? Not the answer you're looking for? Browse other questions tagged discussion voting specific-answer . How can I change my question to be on topic? What to do, if you figure out the answer to your own question?